We are releasing a special edition of our Total Access magazine this week in advance of ISC West and the entire issue can be viewed on our website. While this edition of Total Access contains features found in past issues, such as a letter from President and CEO Byron Whetstone and two recent case studies highlighting 8/28 integration, this issue also provides a look forward into American Direct’s innovative vision for the future of the industry. Insights into the challenges and opportunities presented by the convergence of Divisions 8 and 28 and connects the dots as to why American Direct has transformed to be the first company in the industry to combine Division 8 and Division 28 product, service, and expertise to provide totally integrated safety and security solutions at the door opening. Read more. Details on our new Elite Partner Program for integrators, describing the features, benefits, and requirements to participate in this exclusive opportunity for profitable partnership in 8/28 innovation. Read more. 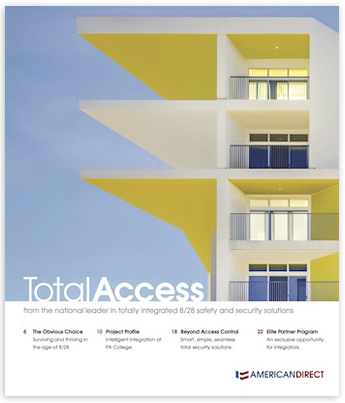 This special issue showcases not only how American Direct has become the national leader in totally integrated safety and security solutions, but why we are the obvious choice in creating safer and more secure spaces for people to work, learn, and live.